In another valley basin, between Hochwald and the Nahe Valley, lies the administrative centre of Birkenfeld and the surrounding "Birkenfeld Land". The land on the upper Nahe River looks back upon a great and eventful history. The most occupied part of land was first mentioned as a town, Birkenvelt, in the year 981. It lies upon a sandstone ridge with a northeast to southwest orientation and is separated from the castle mountain in the southeast by a hollow. The medieval Castle Birkenfeld (first mentioned in the year 1293, but probably much older) was expanded and remodelled towards the end of 16th century to a Renaissance castle. There is a wonderful view over the town from the tower in the north ring wall. 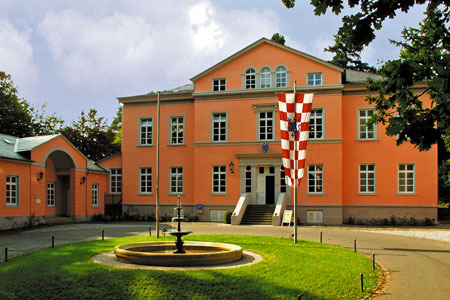 The classical "new castle" (Neue Schloss) dates from the time of the Oldenburgs, when the Birkenfeld land was added to the Grand Duchy of Oldenburg in the year 1817. It sits far from the original castle mountain on a hill in the middle of the town and is today the administrative centre. Not far from the new castle lies the Birkenfelder Museum, which is built in the style of a Roman country villa. It contains a prehistoric and early historical collection that is well worth seeing in addition to a well-developed section devoted to local studies and folklore. This region was the Celtic heartland at the time of the older Hunsrück-Eifel culture (600-450 B.C. ), as verified by the characteristic inventory from the graves of Wickenrodt near Bundenbach with their abundance of bronze jewellery for women. The later Hunsrück-Eifel culture (450-250 B.C.) is demonstrated by the famous princely tombs near the villages of Hoppstädten, Siesbach and Schwarzenbach with their grave goods of Etruscan bronze dishes and domestic gold work. At that time, the first fortified refuges and settlements also arose on the heights, which were secured by ring walls, such as Ringskopf near Allenbach, Wildenburg near Kempfeld, the ring wall near Fischbach and Bremerberg near Kirnsulzbach. The Celtic tribe of Treverians owned the Birkenfield land in their southern settlement and played a leading role from 250 B.C. This tribe and its leader, Indutiomarus, is briefly mentioned in Caesar's book De bello gallico, a standard work of Latin instruction. Besides lesser fortresses, like "Altburg" near Bundenbach, the Treverians also erected fortified towns for the first time, such as the ringed wall area on Dollberg near Otzenhausen, which appears to be of truly gigantic proportions. The working of the rich ore deposits in the region, especially bog iron ore, led to a close economic ties with the southern and southeastern European high cultures in the Mediterranean region, especially with the Etruscans. After the Gauls were conquered by the Romans (58-51 B.C.) the Birkenfeld lands west of Siesbach belonged to the province Gallia Belgica, while the eastern part was added to the province Germania Superior. An impressive memorial from the Gallic-Roman epoch is the burial mound near Siesbach close to Idar-Oberstein. Its circular structure, 21 m in diameter, is surrounded by a double wall and topped by a high pillar on which point the sculpture of a 1.2 m long stone eagle was mounted. After devastating destruction by Teuton invasions in 275/276 AD and the downfall of the Roman Empire in the year 400 A.D., the Birkenfeld land remained largely unsettled for many centuries. It was only when the so-called "forest clearing epoch" began in the 9th Century that it was again occupied by settlers on a large scale. In the 13th century Birkenfeld was one of the administrative centres of the Back County of Sponheim and from 1584-1734. It was the seat of the Dukes of Pfalz-Zweibrücken after Duke Karl, who had previously held the office of rector of the University of Heidelberg, became the first Count Palatine of Birkenfeld. Duke Karl immediately rebuilt the old Birkenfeld Castle according to his taste, as a modern Renaissance castle. Birkenfeld retained the status of the capital of the Back County of Sponheim until the year 1734. In 1776 it was taken over by Baden and was under French rule from 1795-1814. By a curious decision of the Vienna Congress of 1817, the area was added to the Grand Duchy of Oldenburg and became the "Principality of Birkenfeld". This principality existed until 1937! Also worth noting, Duke Friedrich of Zweibrück rose to the position of progenitor of the Bavarian royal dynasty; his son Maximilian inherited the whole of Kurpfalz-Bavaria and ascended to the Bavarian throne in 1806. One final note: no other region in Germany had been divided up into such small territorial dominions and tiny "states" over the centuries as the Birkenfeld land was. Here, the upper Nahe archbishops, Electors, Dukes, Earls and landed gentry had their largely independent estates. Often a single village belonged to two or three different "countries", and in an hour you could sometimes walk through half a dozen territories, each with their own toll stations of course! If you visit Birkenfeld, you should definitely plan a side trip to Frauenburg which stands picturesquely upon a narrow mountain spur not far from the Nahe River. In the year 1331 this castle was chosen by the young widow Loretta, Countess of Sponheim, following her conflict with the Trier Electors as the administrative seat for her new office Frauenberg. Frauenburg Castle is one of the best-preserved castles in the district and serves as evidence of the medieval power politics, in particular vigilance.